Next week I am required to attend two funerals, both of them on Thursday, one in the morning and one in the afternoon. As I have remarked before it is something that I am getting used to as a natural consequence of getting older, but it still jars. I was pondering this situation late last night while the traditional July/August westerly wind was trying its best to batter down the front of my house and, among the thoughts was the one that there have been many changes in the world since I was born some 69 years ago. While I subscribe to the French adage, “plus ça change, plus c’est la même chose” (loosely translated, “The more things change, the more they stay the same.”) there is also a sense that I have lived through a generation that has seen enormous changes in every aspect of society and not all of them have been for the better. I thought today I’d reflect on that thought and look at some of the things that have changed since I was born and what the changes have been. In no particular order, then, cars have changed. 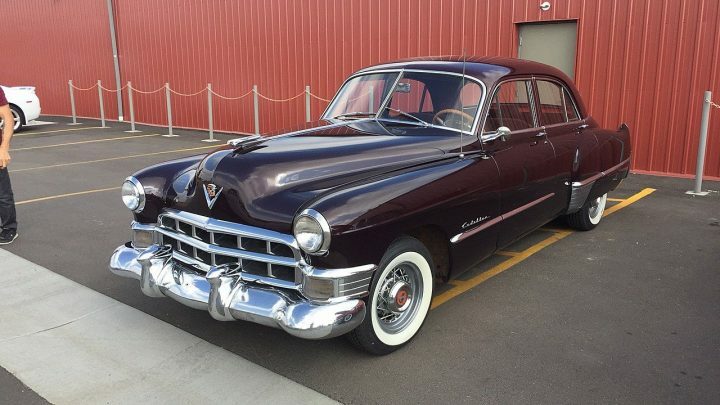 The beautiful 1949 Cadillac pictured above was the height of luxury that year. It was big, heavy and carried its occupants around in a manner that only was enjoyed by the rich and famous. Without looking up its specifications, it would have had a separate chassis and body, a large capacity V8 engine, probably of side-valve configuration, bench seats front and rear an unsophisticated automatic transmission, drum brakes all round and cushy suspension that was very comfortable unless the driver decided to “wind it on” a bit where it would begin to wallow and generally misbehave. At a guess, I’d say it would have weighed around 2 tons (pre-metric) and pretty much everything on it and in it would have been made of metal. The contrast between it and a modern car could scarcely be more stark. A few years afterwards its value would have started to depreciate to a point where, perhaps 10 years later, it would have changed hands on the used car market for a tiny fraction of what its original owner paid for it. What examples that might still be around are either carefully preserved models in original condition or expensively restored examples either of which would now only be exchanged for ridiculously outrageous sums of money. What other things have changed? Well, medicine and the practise of it has changed almost beyond recognition. My dad had his first heart attack in 1959, when I was just 10. His heart was as healthy as a bullock’s but the arteries, courtesy of years of poor diet, lack of exercise and smoking when he was a young man, were shot to bits. Had bypass surgery been available back then, he would have made a complete recovery and lived on to a ripe old age. As it was, he lasted just 10 years before being felled by another massive coronary that took his life at the age of just 58. In May last year when I had a heart attack, I was admitted to hospital in the morning, had a stent inserted in a blocked artery in the afternoon and was back home at lunch time the next day! Of all of the areas that have changed dramatically, technology is one that stands out. In 1949 we had a small, valve radio in our house that received (poorly) a mere handful of radio station signals. Phones, if you had one, were connected manually to other phones through a telephone exchange where operators plugged in the appropriate plugs and cables to enable you to make the call. If you wanted to ring someone outside your local area you had to make what was called a “trunk” call (I’m not quite sure why it was called that, I’m sure someone will know and will tell me) These were also connected through a manual telephone exchange. Calls were timed, three minutes was the standard, I believe and, if you wanted to speak for longer, the operator would interrupt your call and ask you if you wished to extend the call (which cost more money, of course). As a child I remember that my grandfather worked on the telephone exchange within the Port Kembla Steelworks, taking and directing calls around the huge industrial complex. Household appliances have changed, though not, perhaps as much as we might think. The basic processes involved in cooking haven’t really changed much at all and our forebears had a pretty good handle on what was need to cook, clean and manage a house. However, while the appliances have remained similar, their method of operation and control has for now they are all electronic instead of manual and most now contain microprocessors that enable the user to do all sorts of things with them that was previously unheard-of. Of course, this also has enabled the development of multi-function devices whereas one device used to be able to only perform one function. In 1949 our family didn’t have a refrigerator. Instead we had an ice chest and the ice man would deliver a new block of ice each day or second day. Inside the ice chest the ice would gradually melt while keeping perishable food stored there moderately fresh. Only rich people had a vacuum cleaner and, even if they did, they didn’t do a great job. Household cleaning was substantially a manual labour exercise with washing, sweeping and other chores being accomplished without the aid of electricity or, indeed, mechanical assistance. In my pocket I have a device that enables me to communicate all over the world by quite a few different means; it can take both still and moving pictures. It acts as my diary and my notebook. It is my entertainment system, enables me to find my way in unfamiliar surroundings and its stores unbelievable amounts of data. Yes, it’s my smartphone. Not only has this one device made redundant the dozen or so SEPARATE devices that were used to perform these functions less than 10 years ago, but it performs functions that were barely even THOUGHT OF when I was born in 1949. In 1949 breaking the sound barrier in an aeroplane was still a big deal. Now there is a Land Speed Record vehicle that has done that on the ground. When my wife and her parents flew to Australia from Finland to make a new life here in 1959, the flight took them 3 days. It is impossible to think of any aspect of life today that has remained as it was when I was born. Everything has changed. Of course, motorcycles have changed. In 1949 the ubiquitous motorcycle was a British made single cylinder four stroke powered bike of probably around 350cc. The bikes were slow (but the roads were bad so it wasn’t really that much of an issue) they were noisy, smelly, unreliable and cursed with Joseph Lucas electrics, the deserved object of scorn for decades. Yes, they were cheaper than a car and, if you shelled out for a sidecar, you could transport your family around in a much more economical fashion. Thankfully this scenario has also changed. However, some things haven’t changed. People are still the same. While the means of expressing their humanity might be so different as to be unrecognisable, at their hearts, people are still the same. They still have the same needs and wants, and, yes, greeds, too. And, sadly another thing that hasn’t changed is that, unfortunately, people still die. While medical science has done an amazing job in prolonging life, it has as yet been unable to prevent life from eventually coming to an end. And so I will attend and mourn, rejoice and celebrate knowing that I am a cog in a machine which grinds on and knowing that I have some insignificant part to play in affecting, hopefully for the better, the lives of those with whom I come in contact. As my niece said to day, “Why are you worrying, life’s too short. ” Of course, she’s right.